Sounds surprising? This is true that Arjuna was killed by his own son before revived with the help of his wife. When Yudhishthira was conducting ashwamedha yaga, Arjuna came to manipur. Babhruvahana, the son of Arjuna and Chitrangada was the ruler of this state. There was a fight between Arjuna and Babruvahana and Babruvahana succeeded in killing him with an arrow. Repenting of his deed, he determined to kill himself, but he obtained from his stepmother, the Naga princess Uloopi, a gem which restored Arjuna to life. He returned with his father to Hastinapura. This was on account of a curse by the Vasus, on account of Arjuna’s killing Bhishma (who is an incarnation of one of the Vasus) during the Mahabharat war. Babruvahana also killed Karna’s son Vrishaketu in the battle. 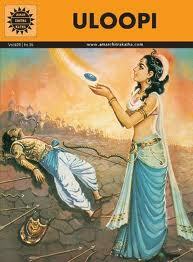 Vrishaketu had accompanied Arjuna in the Ashwamedha Yagna and was consequently killed. Vrishketu became very close to Pandavas following the death of Karna. Pandava knew that Karna was their elder brother. Arjuna had a boon from Uloopi that no creature living in water can do any harm to him. With the help of this boon, he helped five crocodiles which were under a curse. Uloopi was the naga princess who abducted him and married him. This happened when he was on the tour of the country after breaking a rule. During this exile, he married Uloopi, Chitrangada and Subhadra. Babruvahana was born with the alliance of Chitrangada.